Your greatest strengths come effortlessly. It takes work to develop skills, but your strengths came with you from birth. #1. You devalue your value. 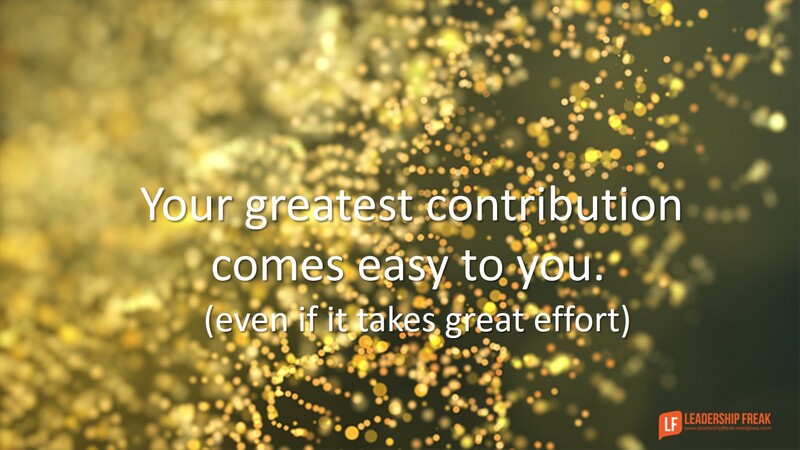 Your greatest contribution comes easy to you. Because it’s easy, you forget how much it matters. #2. You may judge others harshly. Your strengths are a way of seeing. You can’t understand why others struggle with things that are so easy. Our strengths blind us to the value of others. We think others should be more like us. #3. You don’t understand your impact on others. Have you ever been surprised at people’s response to something you did? When you’re in your strength, you move quickly and effortlessly. You may seem rude or impatient to others. Why don’t they get it? Doers want visionary leaders to slow down and celebrate successes. On the other hand, if your strength is analyzing, others may get tired of waiting for decisions. When you’re in your strength-zone, you may forget common courtesies. Your greatest strength is your hammer. Sadly, everyone isn’t a nail. #4. You see solutions through the lens of your strengths. If you’re great with organization, structure is the solution. If you’re a doer, just go do something. Your strengths make you lopsided, like a bodybuilder with huge biceps and skinny legs. See your strengths in the way you impact others. Expand your strengths by leveraging the strengths of others. Evaluate others through the lens of their strengths, not yours. Seek alternatives from those with contrasting strengths. How might leaders address the down side of their strengths? I don’t know how you do it, Dan, but on a regular basis you offer insights that are directly applicable to an immediate situation I’m facing. I just shared parts of this with a close friend who is navigating a personal decision. I specifically liked #1: “You devalue your value” and all four of your suggestions. Thanks. This is me, I’ve just never realized this is exactly what I was doing. Thank you for putting it so succinctly and clearly and for giving me some ideas on how to lead myself better. Dan, wow, what a great post. I need to try to be more mindful of how others may struggle in areas that come easy to me and vice versa. I love people and am comfortable with almost anyone. I love meeting new people and never hesitate to approach people. I know that’s not so easy for others and I can see how I can get impatient when someone struggles in this area. On the other hand I hate confrontation and holding people accountable. This comes easy to others and is a very necessary part of good relationships but its hard for me. So I can see in these two areas how your insight is directly applicable. Its helpful to be reminded to watch for these blind spots and take time to see through another person’s eyes and strengths! Problem #2 is a great point! Especially for individuals who need to work as part of team and tend to judge others harshly in areas the individual has strengths in. It is a good reminder that those others also have strengths that the individual does not have, and may be judging them in the same way for their perceived “deficiencies” . Understanding that may help some individuals be a little more tolerant and improve the overall team environment.